Welcome to TU’s Brook Trout Atlas. 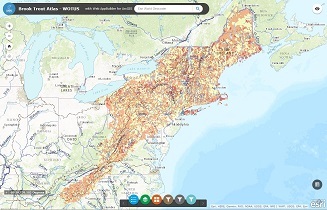 The following interactive atlases provide a means to explore mapped data related to brook trout populations, habitats, and threats in local watersheds and across their eastern range. Each atlas presents a different theme of information and can be used to identify, evaluate, and explore conservation opportunities. The maps allow users to select layers to show on the map, pan and zoom to an area of interest, click on layers for more information, and change reference basemaps. 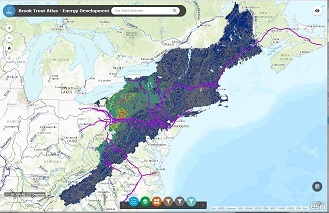 Each atlas describes potential uses and data sources in detail. The Brook Trout Atlas was developed with the support of TU's Coldwater Conservation Fund and uses data provided by federal and state agencies. This atlas presents the results of TU’s Conservation Portfolio, a framework to evaluate each brook trout population for its resiliency to disturbances, likelihood of demographic persistence, and representation of elements of diversity. The atlas includes information about potential life histories brook trout may express, given the diversity of habitats accessible to populations. Conservation lands protect a number of brook trout populations. This atlas presents information on the location of protected federal, state, and other conservation lands within the eastern range of brook trout. Coldwater is a key habitat attribute of brook trout streams. This atlas allows you to explore the pattern of modeled stream temperatures and ongoing stream temperature monitoring efforts within the eastern range of brook trout. The atlas can be a resource for planning future stream temperature monitoring. 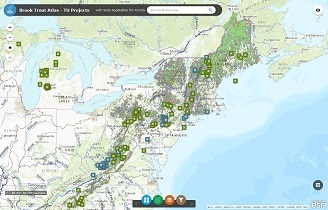 This atlas allows you to explore the location of recent TU projects within the eastern range of brook trout. This atlas presents information on existing oil and gas wells and proposed natural gas pipelines within the eastern range of brook trout. Small headwaters and intermittent streams provide important spawning and rearing habitats for brook trout. The 2015 Clean Water Rule extended Clean Water Act protections to these habitats, but that rule is under review following a 2017 executive order. This atlas presents information on headwater streams in the eastern range of brook trout. Road culverts can impede fish passage and fragment habitats. This atlas presents the pattern of potential fish passage barriers in the form of road-stream intersections within the eastern range of brook trout.